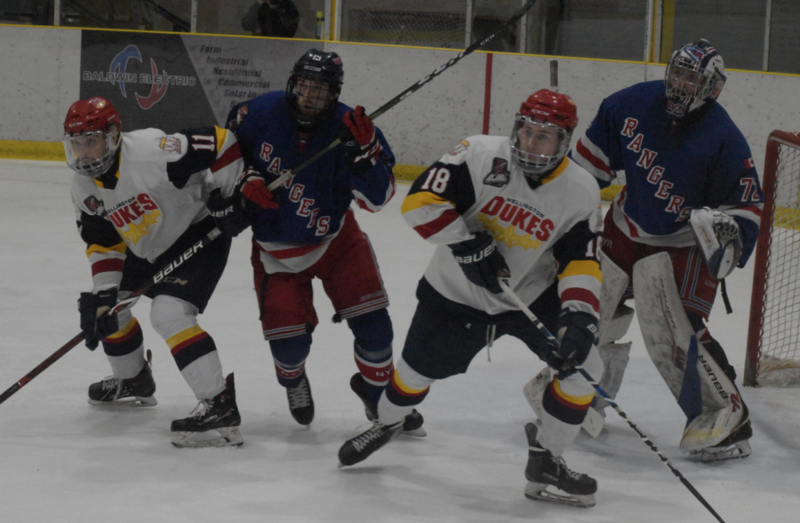 It has taken overtime in each of their two wins but the Wellington Dukes will take a 2-1 series lead into Game 4 of their 2019 Ontario Junior Hockey League Southeastern Conference Finals set against the North York Rangers. 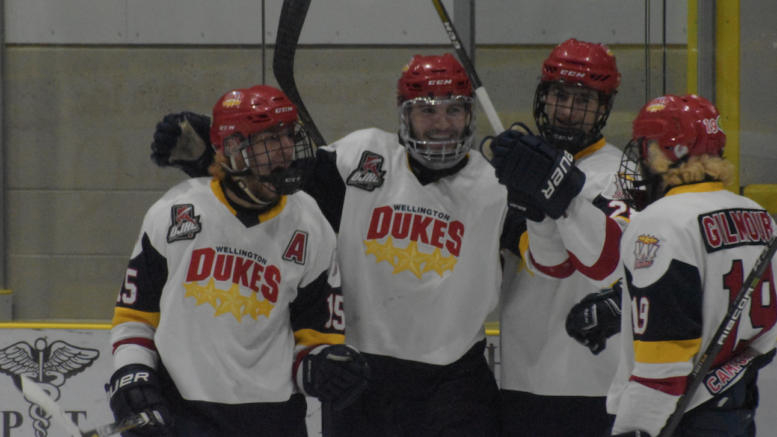 After dropping the opener 4-1 which came two nights after a fatigued Wellington club withstood a physical war waged upon them by the since vanquished Whitby Fury, the Dukes took the Rangers to overtime in Game 2 and Game 3. On Friday night at Lehigh Arena in front of over 800 raucous fans, Ben Woodhouse sent the Wellington faithful home happy when he ripped a shot past Rangers netminder Jett Alexander 13:38 into the extra session. On Sunday afternoon at the Herb Carnegie Centre, Wellington didn’t need nearly as long as Tyson Gilmour broke North York’s heart just 62 seconds into the extra session, knifing a loose puck past Alexander for the 3-2 overtime winner. For Wellington, the end of Game 3 marked the first time they’ve lead a series this early since round one against Cobourg. And for their opponents, North York hadn’t trailed in a series since the first game of round one when the Toronto Jr. Canadiens slipped past the Rangers 3-0. After that early setback, North York had a string of nine straight wins which included Game 1 where the Rangers took advantage of a tired Wellington club that was coming off the emotional high of dispatching the Whitby Fury. Wellington came in as a game club but the Dukes, from the coaching staff on down, likely knew they were fighting an uphill battle as the rested Rangers, fresh off a sweep of the St. Mike’s Buzzers, were licking their chops as the Dukes and Fury battled to the death in seven hard fought games. Andrew Rinaldi would stake the Dukes a 1-0 lead midway through the first but Wellington committed a pair of cardinal sins, giving up a goal to Nick Lashuk in the final minute of play of the first and surrendering a Johnathon Hampton goal 2:05 into the middle stanza just as Wellington had killed off a penalty that came at the end of the first. The back breaker for the Dukes came in the third period as Harrison Rees ripped a puck past Wellington starter Logan Bateman just past the half way mark of the third. Rees would settle things for sure with 40 seconds left in the stanza as he dialled long distance into a yawning Dukes cage to make it a 4-1 final. On Friday in front of an appreciative Dukes crowd that hadn’t seen their favourite team in nearly a week, the locals didn’t disappoint. For the most part, Game 2 was back-and-forth and even the scoring sequences seem to come in waves right on top of one another. Rinaldi would once again open the proceedings with a goal, taking a nice Tyson Gilmour pass and blasting a shorthanded effort between Alexander’s legs for a 1-0 lead at the 13:20. But for the second time in the series, North York would score just as a Wellington Duke had just returned to the playing surface after a somewhat successful penalty kill. Aiden Casey would slip the puck to Josh Rettinger and the defenceman would skate along the blueline and deliver the puck to the Wellington net through a maze of humanity in front of Bateman. The Wellington netminder didn’t see the puck whiz by him just 39 seconds after the Rinaldi tally. Wellington’s second goal of the night would come in the second and it wasn’t completely undisputed by the Rangers. The Dukes started the period by buzzing the Rangers net in order to make life as uncomfortable as possible for Alexander who was upended in the first when a pair of combatants slid into him behind the Ranger net. The Wellington goal came off a broken rush where Rinaldi through the puck at the North York cage and a handcuffed Alexander, forcing the County native to make an awkward save. He puck skittered to the slot where a diving Brett Humberstone lunged to redirect the puck between Alexander’s legs an towards the goal line. AS the puck was crossing the line and referee Justin Kuipers was raising his arm to call a goal, Rinaldi came around the net and wiped the official off his feet. After a brief discussion, the officiating crew confirmed the goal, leaving the Dukes elated and the Rangers and Alexander boiling over. Shortly after the Humberstone goal, Rinaldi had a trademark rush off the wing and drove to the NorthYork net, knocking off the net and driving Alexander to the ice. Wellington would score another goal in the frame off a rebound but as the North York goaltender pushed off to make a third save in the sequence, the net became dislodged and the goal was washed out. In the third, North York would even the score on the powerplay when Brandon Yeamans would fire home a puck past Bateman on the short side at 2:52. Wellington would again get back in the driver’s seat later as Dylan Massie skated off the half wall and ripped a top shelf effort over the shoulder of Alexander at 5:41. But that lead didn’t last long as Ashton Stockie would capitalize off a broken play, firing home his first of the series just 23 seconds after Massie’s goal. Wellington, playing their second game in two nights, would need to grind out the last 15 minutes of the contest and it says here that if Wellington is able to win this series, the foundation for such a series win came during the tale end of the third period of Game 2. Bateman was sensational in the frame, stopping 15 shots and getting whistles to allow fresh (or as fresh as could be) Wellington defenders onto the ice. One astute observer offered that if Wellington didn’t score in the first five minutes of overtime, their legs would abandoned them in the latter half of the extra session and it would be only a matter of time before the Rangers finally capitalized and others agreed. But someone forgot to tell the Wellington Dukes that they should be exhausted and running on fumes in the extra session against the well rested and nationally ranked Rangers. The Dukes took the play to the visitors almost from the start of overtime and save one heart stopping moment where a prone Bateman was tasked with making a goal line save, Wellington poured good quality chances on the North York net. Wellington’s 15th shot of overtime would decide it. After laying siege to the Ranger net, Quinn Hanna and Woodhouse would play a little give-and-go at the top of the circle that allowed the Dukes forward to cruise to the high slot as a mass of players collected in front of Alexander. A wrist shot from about 25 feet away went sailing into the North York net to end the contest in Wellington’s favour 4-3. On Sunday, the Dukes had to play comeback but were more than equal to the task in the late going. Bateman would surrender goals to Yeamans in the late stages of the first and Tyler Flack 31 seconds into the second to make it a 2-0 lead for the Rangers. Wellington finally got on track later in the second off a draw to Alexander’s right. Gilmour would win the draw directly to Humberstone who made a couple of nice moves, coming off the boards and bursting in on Alexander before roofing it at the 13:27 mark. Wellington would tie it in the third off a wild sequence that saw Ben Addison break up a dangerous looking 2-on-1 and turn the puck back towards the Ranger zone. Rinaldi would lug the puck to the corner and a seeing eye pass that fooled nearly everyone in the rink would wind up on the stick of Frank Vitucci. The Yardley, PA native made no mistake one timing the puck into a virtually empty North York net at the 11:40 mark to tie the game up at 2-2. 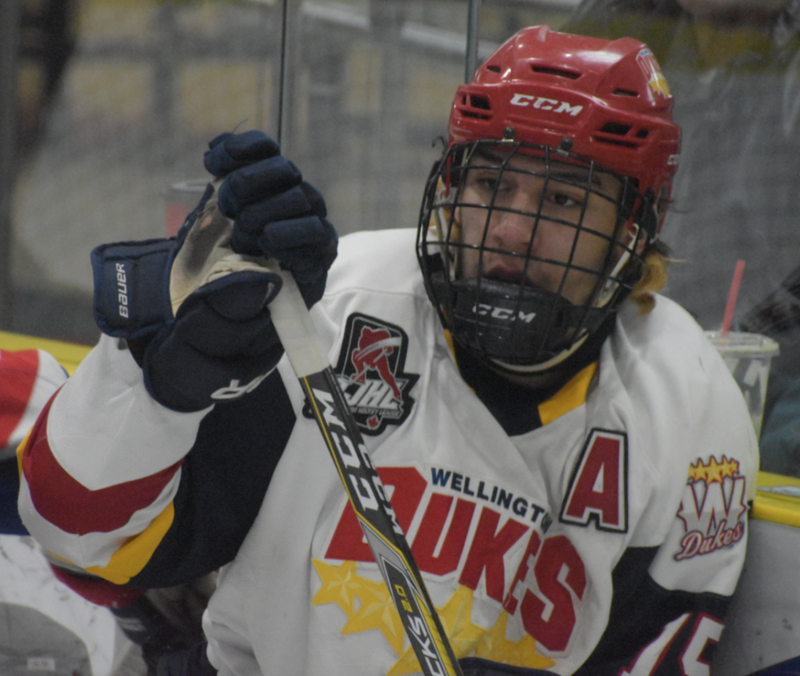 Wellington’s Elijah Gonsalves would have a glorious chance times three in the same sequence in the late going as the Dukes pushed to win their seventh road win of the 2019 Buckland Cup playoffs. In overtime, Wellington again scored off a draw play. Gilmour would win another draw to the right of Alexander and Gonsalves would put a low shot on the North York net. A rebound would find the stick of Gilmour and Killer Jr as he’s been monikered in these playoffs put a low shot over the right pad of Alexander for a 2-1 series lead. Wellington hosts North York at the Lehigh Arena on Tuesday for Game 4.